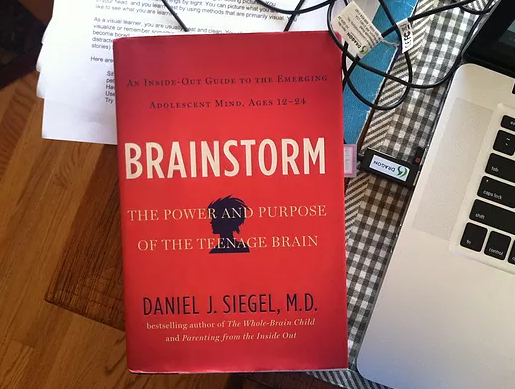 If you have a teenager in the house, or are about to have a teenager, I highly recommend you read Brainstorm: The Power and Purpose of the Teenage Brain by Dan Siegel. (And I would also encourage you to have your teenager read it; he alternately addresses adults and teenagers throughout the book.) In it, Siegel sees teenagers in a new way. For instance, he argues that adolescence is an important time in our lives when we learn about taking risks, developing creative strategies for dealing with problems, and how to navigate relationships. It helps debunk the idea that teenagers are hormone-crazed, reckless, and indifferent, and opens readers up to the powerful gifts of this stage of life. And by the way, his definition of the teenage years spans from 12 to 24. So even if you have a child off at college, this book will be relevant to you. Siegel draws on research in the field of interpersonal neurobiology to show readers how understanding brain functioning can help us better interact and live with teens. Knowing what is going on in my teenage students’ brains has given me new insights on how best to work with them. His chapter on the changes and challenges that occur during the teenage years and how we as adults can help usher teenagers through this time was especially helpful.